Lily was born Nov. 30, 2012. On Nov. 18 of this year, she had her first meeting with Tusko. 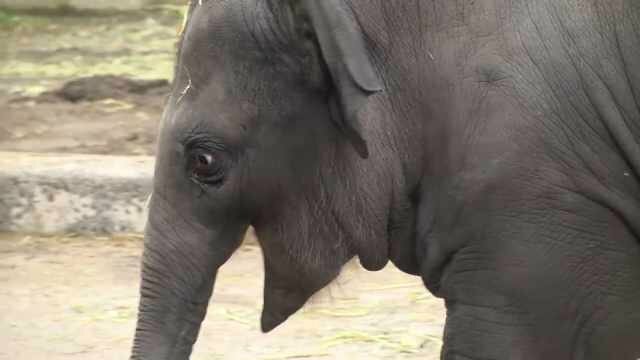 It was a brief, yet dramatic encounter, according to zoo workers. Lily’s mom Rose-Tu, along with the other adult female elephants, supervised the encounter. After a cautious initial greeting and head nudge from Tusko, the rest of the herd quickly circled and erupted into trumpeting that could be heard throughout Washington Park. The female elephants then fell into a row, creating a protective barrier for Lily and Tusko to touch trunks. As in the wild, elephant bulls at the Oregon Zoo seldom stay long with the matriarchal herd, making only brief appearances to check the status of females.